Remember back in May when we introduced you to the second electric car manufacturer to be named after now-legendary Serbian-American inventor, Nikola? At the time, the small aspiring automaker was promising one main vehicle, appropriately called the Nikola One, which the company boldly claimed would use a combination of a 320kWh battery, a range-extending turbine engine, and six electric motors to deliver 2,000 hp, 3,700 lb-ft of torque, and a total range of up to 1,200 miles per fill. Well, things started to look grim for Nikola when the much-larger Tesla Motor Company announced that it, too, was developing an electric semi truck. Given the enormous clout that Tesla already commands, this could spell trouble for the startup, and so it decided to do for semi trucks what Chevy is doing for affordable mass-market EVs—deliver it faster. Nikola has announced that it will be unveiling a fully-functioning prototype of the Nikola One in December (coincidentally also when Chevy is delivering the Bolt). This would make for a surprisingly quick turnaround for a company that had been keeping out of the limelight before May. 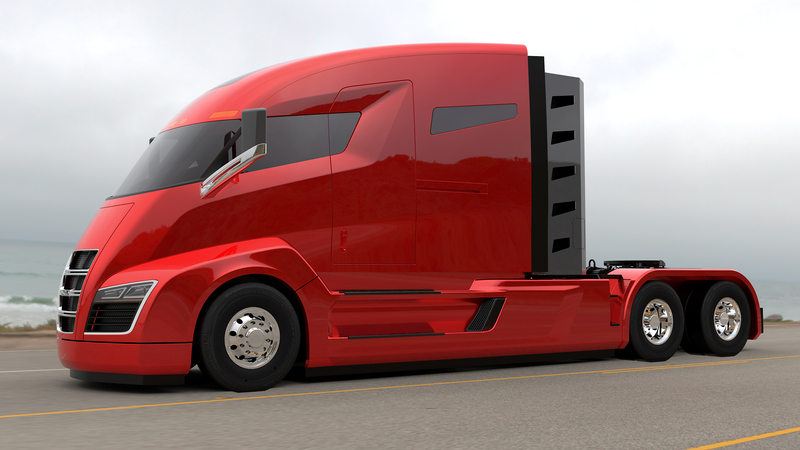 Not surprisingly, Nikola Motor Company CEO Trevor Milton expressed extreme optimism in the Nikola One, calling it the “Holy Grail of the trucking industry” due to its reported zero-emission powertrain. This would be a surprising feat for a vehicle which runs on compressed natural gas, which, while much cleaner than gasoline or diesel, still usually puts out emissions. Milton somewhat ambiguously explained this feat by saying, “It requires a specific zero emission refinement process of fuel and gutsy engineering and product execution.” In addition, he added, it takes a team of world-class engineers. Hopefully we will get more information in December, and a look at the functioning Nikola One.